Lasino Landgraf/Capitol The best kept secret in Holstein. Lasino is by Landgraf/Capitol/Lord/Roman. 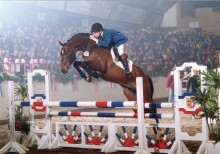 Lasino sired 3 offspring who competed in showjumping at the ’08 Olympics in Hong Kong. Many others competing all over Germany and throughout Europe. Click Here for more information. 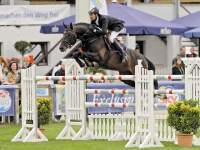 Limbus Landgraf/Fier de Lui/Marlon Stamm: 6788 117 score at l00 Day Test Very attractive, modern son Landgraf. High thoroughbred percentage makes him a stallion that you can use for refining. Limbus, his mother, has Fier de Lui Z as father. S.I.E.C. Livello is for now the most known Limbus offspring. Click Here for more information. 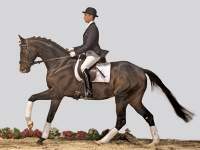 16.2 Loutano/Latino/Farnese Brings dressage horses and showjumping horses. 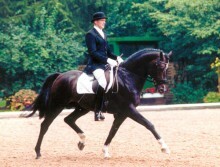 Unbelievable dressage movement; extremely athletic through the back. 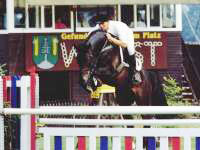 Won all his classes for young dressage horses; qualified for German Championships. Very young stallion already producing premium foals and a stallion candidate. 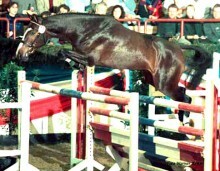 Nekton Nimmerdor/Coriano 143 index in jumping. 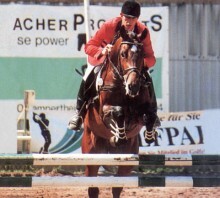 Best stallion at his test in Adelheidsdorf. Click Here for more information on Nekton. Quantum Quidamderevel/Cordelabryere/Colt Stamm 18B1 Grand Champion of his stallion approval. 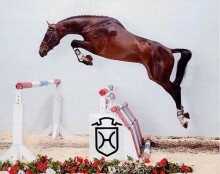 Has produced two phenomenal jumping sons, Quintero and Quality Time. Continues to prove himself through his get.